. : Wyndy's Race Tales: Seefeld Report #2 :: Ski XCOttawa.ca :: Skiing in Ottawa and Gatineau Park :. XC Ottawa alumni Andrew Wynd is on the trail for another World Championships! But this time he's headed there straight from a Down Under summer. Here's the second in his series of prep races..
Hello to everyone from Seefeld, Austria nestled in the alps of the Tirol region. We are at 1300m above sea level and this is the epitome of an Austrian ski village with wood carvings on all the balconies and plenty of fur coats, cigars and beer. The ski trails are excellent here and will make a good training base over the next two weeks into the start of the World Championships in Czech Republic. I arrived four days ago with an uneventful plane ride, all my luggage and a short train ride up to the village where I was met by one of the other Australian Team members, Andrew Mock. 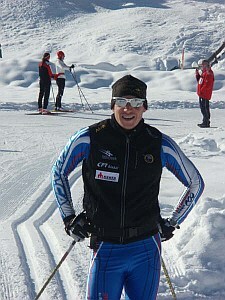 Since arriving and I have settled in well and have been skiing around 3 hours a day in an effort to regain balance on my skis and re-discover the necessary timing and feel on the skis. Today I opened my racing account with the Koenig Ludwig Lauf 23km skating race and finished in 18th place. This race is part of the prestigious World Loppet circuit and is in honour of King Ludwig II. It takes place in Oberammergau, a world renowned destination known for its Passion Play tribute to Jesus Christ’s crucifixion. This was a solid result as I was only a few minutes back and skied into the finish with skiers from 12th-20th. After a moderate start, I worked hard to bring a group of skiers up to the chase pack and then the track narrowed to a point where passing was near impossible, With no local knowledge of the finish section I came into the last 1km behind a large group of skiers and had possibility of passing, hence finishing behind all of them. Given the horrible run of injuries that have plagued my preparation thus far, I was given a much needed dose of confidence after today with only minor discomfort through my chest and back. It remains to be seen how I will recover tomorrow, but so far this is a promising sign. The nest week sees another large volume week of training and then another “Loppet”style race called the Koasalauf. This event draws around 2,000 competitors and I will probably compete in the skate and classic events. The weekend after will be a continental cup race in Zwiesel, Germany and then we move to the World Championships site at Liberec, Czech Republic. If you want coverage of the events, the best place to see me on TV is on Eurosport Live, which unfortunately in Australia requires a large satellite dish to gain access. There is Eurosport news on Foxtel, but this will likely only have highlights of the events. It is a pity Australia does not have such good coverage as Europe, as we watch cross country skiing live most days on TV over here. For those that don’t have Eurosport, online coverage via the official website (www.liberec2009.com) or on Eurosport online (www.eurosport.com) or on the FIS skiing website (www.fis-ski.com). These sites will all have live video feeds of the events and should have excellent coverage. That is all for now, back to training, sleeping, eating, training etc…..
Race Preview: 2014 Weber Loppet Registration is Now Open! !